Furry Friend Friday With Boots! Happy Furry Friend Friday everyone! It’s not too often that we interview one of our feline friends, so today’s interview was extra exciting! 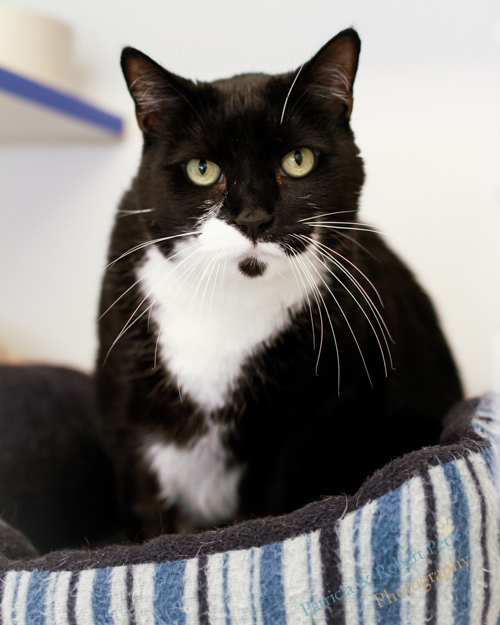 Meet Boots, this handsome boy is up for adoption at the Sterling Animal Shelter in Sterling, MA. He’s 8 years old and has been waiting for his forever home for a while now! Because of Boots’ age, he qualifies for the shelter’s “Seniors for Seniors” program, meaning adopters over 55 years of age won’t have to pay an adoption fee (although donations are accepted). How can you resist that face? Stop in and visit Boots right meow! So Boots what is your favorite way to spend the day? Well I really like to be around people, believe it or not. I’m not a typical stand-offish cat, I love being petted! I guess you could say I’m almost like a dog in that way. I’m a great cuddler, and would be the perfect lap cat because I enjoy just lounging around with my people and getting all of their attention! Oh and I also love my cat bed, can’t forget about that! Do you have any favorite toys that you like to play with? I’m a little too old for toys if you ask me, I’ve had my fun with climbing towers, squeaky toys, laser pointers, yarn, and any other toys I could get my paws on, but now that I’m more mature I enjoy spending my time in other ways. I think treats are popular with cats of any age, and I’m no exception to that rule! I love treats, don’t really have a favorite in particular, I’ll take whatever I can get! I’m no scaredy cat! I’m very outgoing and there isn’t much that gets to me or makes me nervous. Well as an older guy, I think I would get along with an older person perfectly! I’m not very high energy and just like to sit on the closest lap and cuddle. Don’t get me wrong I still have a lot of great years left, but I’m not as rambunctious as a kitten and think I would do well in a home with older folks. Boots why do you think pet insurance is a good thing for all pet parents to consider? Well not that I’m a fan of the vet or anything, but I think it’s inevitable that all pets will have to make an unexpected trip or two to the vet’s office. Pet insurance seems like a smart way to ensure that your pet, and your wallet won’t be hurting after your visit! Boots is right! It does seem as though all pets eventually need to make an unexpected trip to the vet, whether it’s for a accident, sickness, or anything else that might come along, pet insurance will prepare you for the costs associated with vet visits and reimburse you up to 90% on covered claims! Give us a call today for a free quote and take the first step to protecting your furry friend’s future.